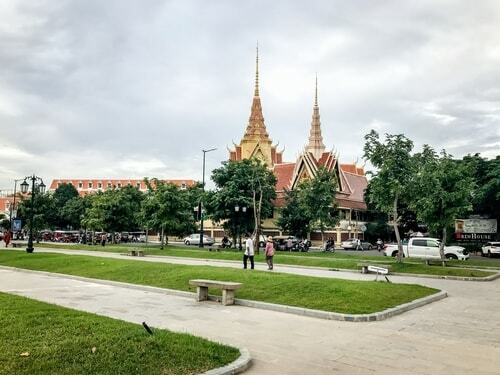 The Independence Square is located in the center of Phnom Penh. 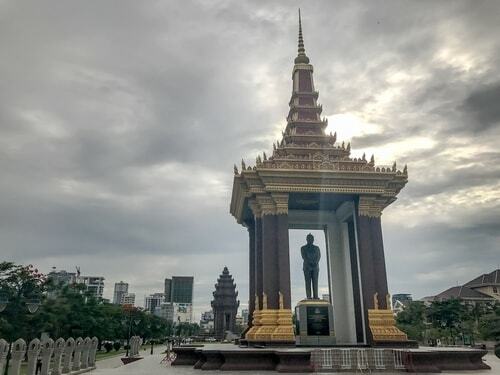 The Independence Monument was built in 1958 for Cambodia's independence from France in 1953: it stands on the intersection of Norodom Boulevard and Sihanouk Boulevard in the centre of the city. It is in the form of a lotus-shaped stupa, of the style seen at the great Khmer temple at Angkor Wat and other Khmer historical sites. The Independence Monument was designed by the Cambodian architect Vann Molyvann. Wat Botum (Temple of the Lotus Blossoms) is a wat (pagoda) located on Oknha Suor Srun Street 7, Sangkat Chaktomuk, Khan Daun Penh, Phnom Penh. It is located south of the Royal Palace, on the western side of Wat Botum Park. 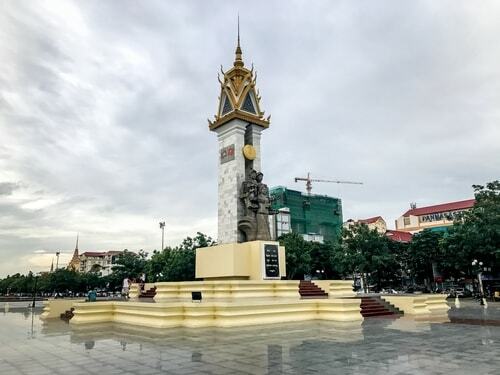 The Independence Monument was built in 1958 for Cambodia's independence from France in 1953: it stands on the intersection of Norodom Boulevard and Sihanouk Boulevard in the centre of the city. It is in the form of a lotus-shaped stupa, of the style seen at the great Khmer temple at Angkor Wat and other Khmer historical sites. 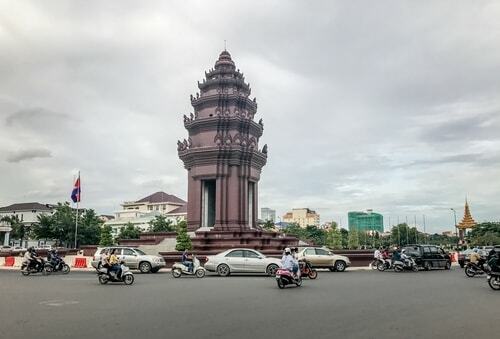 The Independence Monument was designed by the Cambodian architect Vann Molyvann. 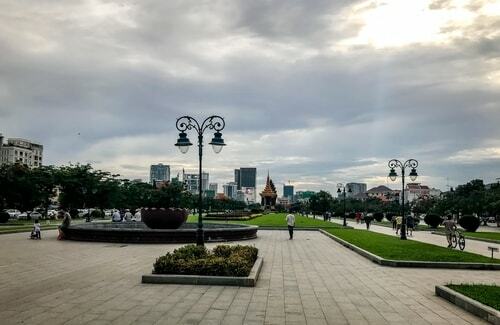 The Cambodia–Vietnam Friendship Monument in Phnom Penh is a large concrete monument commemorating the former alliance between Vietnam and Cambodia. In the park just east of the Independence Monument is a statue of the former king/prime minister/statesman King Father Norodom Sihanouk, who died a national hero in 2012. South of the Royal Palace complex, flanking Sothearos Boulevard is the Wat Botum Park. Within the park is a golden stupa commemorating the sixteen people killed outside the old National Assembly building on March 30, 1997. 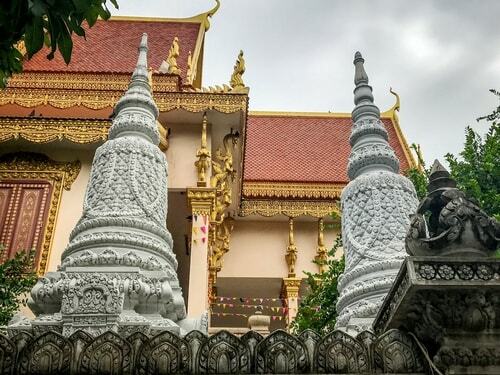 An intricate, bustling Buddhist pagoda with gilded accents and public meditation sessions.